If nuisance barking is a problem, consider these issues to find a solution. Some dog owners love coming home because their dog greets them excitedly by jumping and barking. They feel this proves their dogs love for and bond with the family. But look at a dog in a natural setting; she doesn’t bark and yelp and jump on her pack mates in a burst of affection. So what are these dogs trying to say? Dogs that greet their owners in this way are trying to communicate. But rather than professing undying love, they are trying to tell you that they are lonely and bored and that their needs as a dog are not being met. The excitement that you see is your dog’s way of burning off the excess energy that has been building throughout the day. The dog may also develop separation anxiety (see below). People shouldn’t be disappointed by this revelation. This just means that dogs don’t use emotions like people do. Remember, they’re dogs. To love a dog means you must treat him like an animal, which means fulfilling him as Nature intended him to be fulfilled. Now, let’s get back to our barking dog. So-called nuisance barking, which is often ongoing and not in response to a particular stimulus like a jogger running by the house, is your dog’s way of sending you a distress signal. Somewhere his needs as an animal are not being met. Is his world anchored by a pack leader who projects calm-assertive energy? Are you walking with him every day, which exercises his body and his mind? Is he living a balanced life? If nuisance barking is a problem, consider these issues to find a solution. It’s the best way to show real love for your dog. If your dog jumps on you when you arrive home, she's the pack leader. How can you tell if your dog is the pack leader? It’s simple: If she jumps on you when you arrive home, she is the pack leader. If she jumps on your guests, she is making sure that these new arrivals also know she is in charge. What can you do to stop this unwanted behavior? Most importantly, you need to establish yourself as pack leader. When a dog doesn’t have a clear pack leader who projects calm- assertive energy, she tries to fill the vacant role, usually to disastrous results (for the owner and for the dog). Don’t shower your dog with affection when you walk through the door. This kind of attention is wonderful for a human child, but not for a dog. Remember dogs are animals, and the kindest thing you can do is to treat your dog like a dog by communicating in a way he’ll understand. The dog's mom, the ultimate pack leader, would never tolerate inappropriate activity. 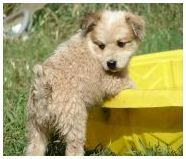 If she sees something she doesn't like, she stops the activity by moving the puppy out of the way in her calm-assertive manner. The puppy learns an important boundary from the lesson, and her firm and unambiguous leadership balances the puppy's submissive role in the pack. When your guests arrive, ask your dog to sit patiently. Your dog will follow your commands when he respects you as his pack leader. Remember, the animal pack leader doesn’t negotiate to get what he or she wants. 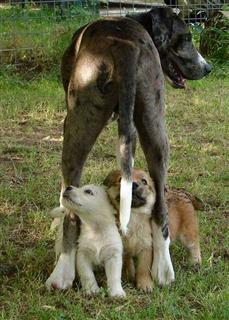 The pack leader leads by projecting a calm-assertive energy, the language dogs use to communicate. The most important thing to remember is that you can’t be a leader only some of the time. 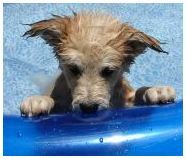 Leadership is forever; inconsistency triggers confusion and anxiety in a dog. Animal pack leaders never waver from their leadership role, and neither should you. Walking exercises your dog's body and stimulates your dog’s mind. Dog moms teach their puppies a lot during their first few days and weeks of life. They set rules, boundaries and limitations and serve as the first pack leader of the puppy’s life. They also walk with their puppies, which is an important primal activity for dogs. In their natural habitat, dogs earn food and water by walking and they get to experience the world. If a dog does not walk, she does not eat. You can see how this activity exists deep within a dog’s DNA, but too few dog owners recognize its importance. Walking also exercises your dog’s body and stimulates her mind. It also provides a good opportunity for you to establish yourself as pack leader. I walk about ten dogs at a time, sometimes off-leash if I’m in a safe area. 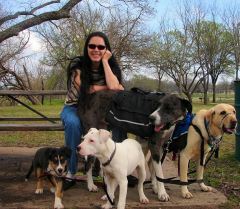 People are amazed by this, but it’s simple: the dogs see me as their pack leader. This is why they follow me wherever I go. Walking in front of a dog allows you to be seen as the pack leader because position matters to a dog. Conversely, if your dog controls you on the walk, he’s the pack leader. Master the walk, and your dog will relate to you as the pack leader and accept his submissive role within the pack. Remember, most dogs are born into the submissive role and like it just fine. The problem starts when naturally submissive dogs try to fill what they see as a vacant pack leader role. Since Nature never intended them to take on this role, bad or unwanted behavior ensues as they act out or try to normalize their world. During the walk you may feel the highest level of connection with your dog.Many dog owners believe their dogs only crave love and affection and treats. Not so. Dogs crave rules, boundaries and limitations from their pack leader. They also crave walking, a primal activity that they live to enjoy. Dogs become aggressive out of frustration and dominance. Any breed can cause trouble, but the bigger breeds can create bigger damage. This is where I find a lot of what I call my red-zone cases. Its important to recognize the power of a strong breed like the pit bull and the Mastiffs. These dogs are very powerful and can destroy anything in an instant. Remember that these dogs don’t dream of being in the news when they grow up. Dogs don’t premeditate bad acts like people do. Bad things happen when powerful breeds (or mixes of powerful breeds) live with humans who like the breed but don’t understand the animal in the dog. In a larger breed, frustration will intensify what the animal can do. Many people consider the look or popularity of a breed before thinking about whether the dog works for their lifestyle. This is a recipe for disaster. To control a powerful breed you need to become the dog’s pack leader and establish rules, boundaries and limitations. You need to fulfill the dog as Nature intended him to be fulfilled. Dogs become aggressive out of frustration and dominance. The frustration comes from a lack of exercise, and the dominance comes from a lack of calm-assertive leadership. A good start to correct these problems: exercise, discipline, and only then, affection. You need to establish a balance between patience, obedience, and confidence in your dog. If he barks in the crate, look for ways to control that. Teaching him “quiet” is good, and interrupting the barking so he learns there is no reward from it also works. In extreme cases, a good bark collar can help control the dog's barking in your absence. No one wants annoyed neighbors, and this device will correct him when you are not there.